The Snack Shack (est. 1941) along Central Ave. features mementos of jazz history in its tiny, but comfortable, patio area. Sahra Sulaiman/Streetsblog L.A.
Folks do indeed wonder why their community is lagging behind, this is true. But I can guarantee you that the vast majority of them are well aware that that lag has far more to do with structural inequalities and decades of disinvestment in the area, not the name it goes by. And one only need peruse the comments section of any mainstream news story on “South L.A.” to see that the name change has done little to alter outsiders’ negative perceptions of the area. Meanwhile, many who have grown up there continue to speak of “South Central” and the fierce resilience of the community with great pride. “South L.A.” may be what we advocates use to describe the 51-sq. mile swath of town south of the 10 Freeway, but “South Central,” for many residents, is about more than geography — it is part of their identity. Whatever Parks’ motivations as he prepares to leave office this summer (and let’s hope it was not inspired by the new, massive SoLA Village planned for Washington and Hill), his idea is not coming completely out of left field. Renaming, re-vitalizing, re-habilitating, and re-invigorating communities and re-introducing them to the world seems to be all the rage right now. Like with the idea of the name change, however, what sometimes tends to be missing from these efforts is a deeper discussion of how we will get from A to B — how more substantial changes will be effected, particularly in lower-income communities where insecurity in the public space and the lack of access to jobs often present significant hurdles to community-building — and who exactly these “re-imaginings” are for. Too often, for those on the margins, these approaches to urban interventions seem to imply that neither the area nor its current crop of residents are particularly palatable to outsiders. Which is not to say that re-branding can’t be of value when done properly. One only need to observe the community-driven change happening in Leimert Park — often considered the cultural beating heart of the black community — to see how transformation from within can lead to the very sort of organic and sustainable activation of neighborhood spaces Parks seems to be looking for. In anticipation of the arrival of the Crenshaw Line in 2020, stakeholders there have been working for well over a year to re-brand the area as a hub for innovative black creatives grounded in the history and culture of the African diaspora. The ongoing changes — the opening of new art and community spaces, active arts programming, exploration of site-specific tactical urbanism projects with students from USC, efforts to shore up the economic foundation of the community, efforts to aid the homeless, an initiative to start a bike co-op, plans to engage foster youth, and weekly conversations about what the future of the community should be — have laid a strong foundation for growth. These efforts are what made it possible for the community to take on a People St Plaza project and deploy it in a way that would fit their vision of how they wanted the community to be seen. 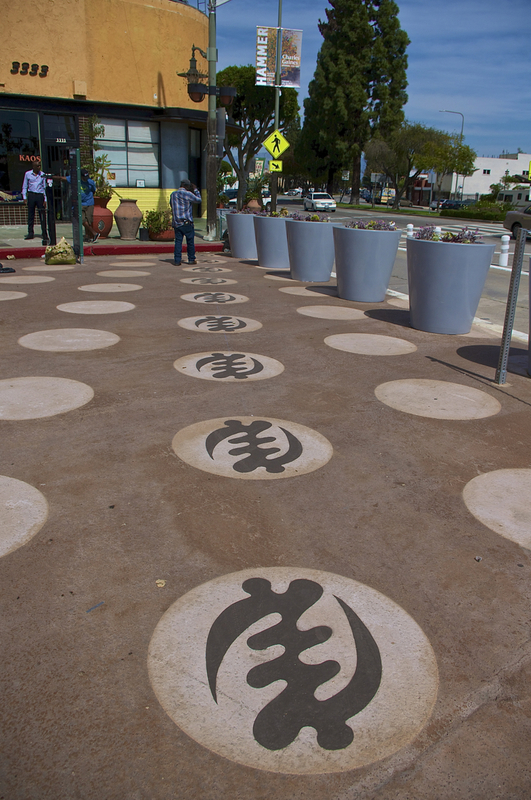 Some of the Adinkra symbols community members have been painting in the polka dots on the People St Plaza as part of the re-branding effort in Leimert Park. Sahra Sulaiman/Streetsblog L.A. If there are any lessons to be learned from the efforts of the Leimert Park stakeholders, they are that re-branding must be grounded in something real and it must be something that the community members themselves believe in. By that measure, alone, “SOLA” — which incidentally means “alone” or “lonely” in Spanish — probably would not qualify as a particularly useful or viable name change. But beyond that, it may be time to dispense with the notion that South L.A. is a single, coherent neighborhood. When CicLAvia rolled through South L.A. in December, they created a guide to the area to provide participants with an overview of the history as related by some of the important voices from the area. By mixing in excerpts from the 1992 Blood and Crips peace agreement with a discussion of the Black Panther Party, the showcasing of the KAOS Network and The World Stage, voices describing the pain of the 1965 Watts Riots, and a voice in Spanish describing a young girl’s impression of a botanica, however, some stakeholders raised concerns that the guide had unintentionally sent the message that South L.A. was one giant amorphous and chaotic place. The reality is very different. Over the years, much has changed — and continues to change — in South L.A. What was once a largely African-American community has now become predominantly Latino, in large part because of the demographic changes spurred by the unrest of 1965, 1992, and, more recently, recessions and a foreclosure crisis that hit the area very hard. As a result, its many distinct neighborhoods each have their own history, character, feel, and aspirations. Take Central Ave., for example. 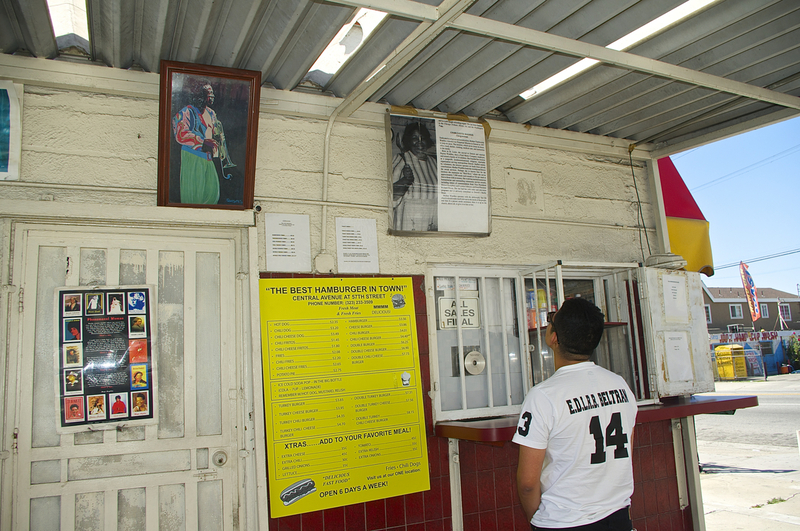 Historic memorabilia at the Snack Shack hints at the past glory of Central Ave. Sahra Sulaiman/Streetsblog L.A. Along Central’s historic jazz corridor — the center of black social, artistic, and intellectual life in pre-WWII L.A., thanks to segregation and racial covenants that kept African-Americans from being able to freely access other parts of the city — the past is essential to understanding the unfolding of race relations across the city. But take a walk along the corridor today, and that past can feel quite distant. Historic memorabilia referencing Central’s jazz history can be found displayed at long-standing shops like the Snack Shack (above), a hamburger joint established in 1941 at 56th and Central. You can also find musical instruments and an incredible range of memorabilia from the jazz era in the historic Dunbar Hotel (now converted into a senior residence), if you can find someone to let you in to take a look around. But take a bike ride up Central in the evening, and the only music you’re likely to hear blaring in the streets will be linked to mariachis, Zumba classes, Latino churches, food vendors, or private parties (where selections vacillate between cumbia and salsa). The monuments to the guitar and the saxophone at Vernon Ave. hint at what once was, but standing, as they do, in front of a strip mall botanica and the Los Carnales restaurant, they feel a bit like they got lost in the shuffle. Can you spot the guitar welcoming you to the jazz corridor? Sahra Sulaiman/Streetsblog L.A. While that might make it sound like much has been lost, it is also true that much has been gained. The business corridor, mainly populated with family-owned businesses, friendly barber shops, and even a bike shop local kids can hang out at, is always bustling. Organizations like the Coalition for Responsible Community Development and A Place Called Home have worked hard to engage area youth and build positive relationships between the youth and the community. 3 Worlds Cafe — a collaboration between Chef Roy Choi, Dole, students from Jefferson High School, gang interventionist Aqeela Sherrills and others — has become known as a “neighborhood social justice cafe,” healthy food zone, informal community meeting center, and site for open mic performances on Friday nights. Job training sites and schools are nestled safely on the campuses of Christian and Islamic religious centers. The Central Avenue Farmers Market calls Council District 9’s “green”-roofed building its home, and numerous street vendors fill the gap in the area’s need for fresh produce and make the street feel alive. And more change is in the works. Given all this, how would that neighborhood brand itself today? Does “SOLA” accurately capture where the community has been and where it is headed? And if it fits along Central, how could it possibly fit in communities undergoing different kinds of change? In areas where change is being driven by development projects, the future form of those communities is still uncertain. With a massive overhaul of the Baldwin Hills-Crenshaw Plaza, a new shopping mall development just south of the Expo Line at Rodeo (slowly moving forward), and the changes that will come along with the Crenshaw Line itself, Crenshaw is poised to become a denser and much more active (and possibly, some fear, gentrified) business corridor. Should a recent proposal for the overhaul of Jordan Downs, one of Watts’ main public housing developments, finally go through, Watts could be in store for a fundamental transformation of the community. The area around USC — including areas south of Exposition Bl. and along the Expo Line corridor — is rapidly becoming a hub for well-to-do students who, just 5 to 10 years ago, wanted to live anywhere but near the campus. And the new housing and retail village under construction at Jefferson and Hoover — set to house as many as 2700 students — is already exerting pressure on the increasingly pricey real estate and business landscape, while the increased presence of law enforcement makes the area’s lower-income residents of color often feel like they don’t belong there anymore. Around USC, community members have both organized against gentrification and turned nearby Mercado la Paloma into their own vibrant cultural, justice, music, and arts hub. Advocates in the Crenshaw and Leimert Park area worked to ensure Metro provided aid to small and disadvantaged businesses during construction of the Crenshaw Line so the last stronghold of black-owned businesses would not be lost. 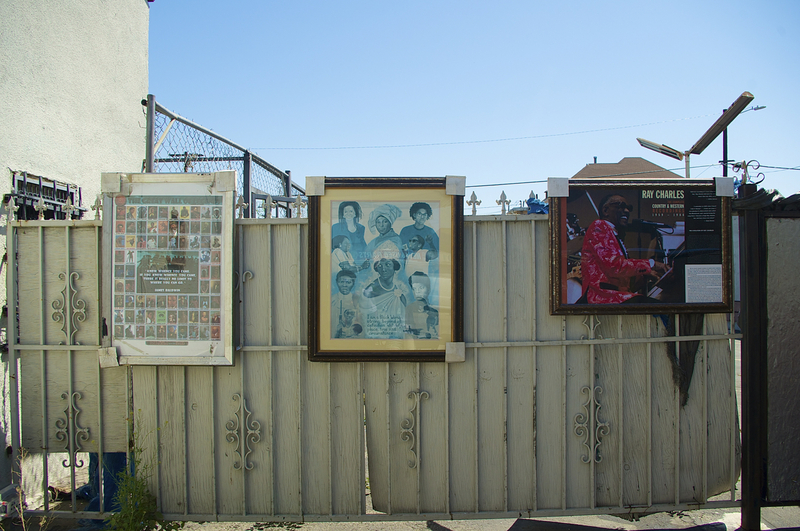 In Watts, the United Riders of South L.A. consistently spread messages of positivity, pride, and coexistence in what may be some of the most contested streets in the entire city. And, together with advocates like Tafarai Bayne (then of TRUST South L.A.), Andres Ramirez Huiztek and others from Community Health Councils, and the Black Kids on Bikes, they have managed to put South L.A. biking culture on the map. Community Coalition (whose former executive director, Marqueece Harris-Dawson, is now the 8th District’s newly-elected representative) successfully fought to limit the growth of liquor stores in the post-1992 era, fought to put an end to willful defiance explusions in schools, and has made a once-off-limits park space on Western Ave. a welcome zone for families and the site of South L.A.’s best party of the year — South L.A. Power Fest. Dedicated teachers implementing social-justice-oriented curricula at Augustus Hawkins have been effective in helping their students partner with a local business and non-profit agencies to bring healthier snack options to their community. South Central/South L.A./SOLA is in some serious flux, in other words, with change being driven both from within and from without. It can’t be defined as it once was. And those negative and outdated stereotypes about the community never fit it all that well, anyways. South Central, is that you? 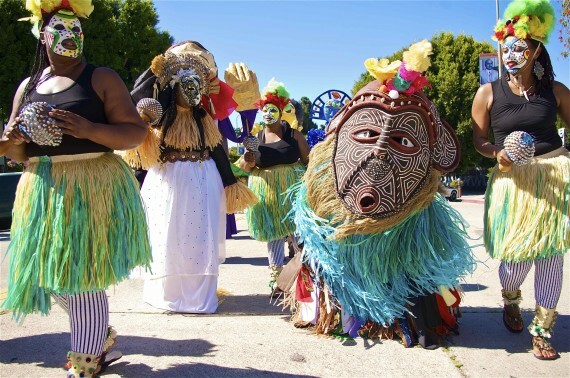 In Leimert Park, the Mask Festival honors the ancestors. Sahra Sulaiman/Streetsblog L.A.
And, yet, there is still so much more to be done. For all the incredible people that comprise the area and the important contributions they make to their neighborhoods, South L.A., as a whole, still struggles to overcome the legacy left by decades of disinvestment in the area. One does not fix the lack of opportunity, the school-to-prison pipeline, a poor relationship with law enforcement, disenfranchisement, the challenges of re-entry, struggling schools, gang issues and insecurity in the public space, community trauma, and poverty by waving the magic name-changing wand. Thankfully, members of the city council recognized that yesterday and put off voting on the motion, referring it instead to a neighborhoods committee, where the public will be able to weigh in. But even that seems like a waste of time. If we want to have a conversation about a changing South L.A., then let’s have a serious conversation and let’s match the words to meaningful actions. Let’s celebrate the unique character of South L.A.’s many neighborhoods and let’s give them the tools they have been asking for to help them thrive the way they wish to. But let’s not implement another superficial change and assume we’ve done enough. We can at least start by acknowledging the individual names of the communities. Whether it’s Chesterfield Square, Leimert Park, or yes South Central, the individual community names should be respected. 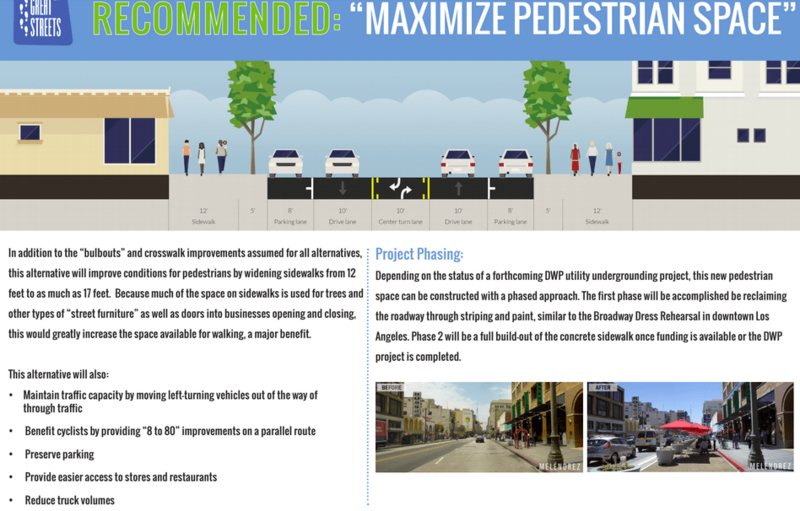 I’ve been to and read about several proposed bikeway projects on major streets in Los Angeles and there frequently is an effort to try and put the bike lanes along another street, any street, just not the one that was first suggested. That’s what is happening for bike lane installations for Central Ave. What’s going to happen is that the bicyclists will be mixed in with the pedestrians on Central Ave. The bike riders are still going to ride along Central Ave, but since there is no on-street separation for them to ride on they will use the sidewalk instead. The places that cyclists need to go are the same as they are for pedestrians, transit users and motorists. What is going to be created is a mixed use path for pedestrians and cyclists. Yeah, I completely agree that they will be thrilled to have a wider sidewalk. The vast majority already ride on the sidewalk and, contrary to what the city believes, for South LA riders, corridors simply are not interchangeable. I’ll be talking more with the Great Streets people, hopefully tomorrow, to learn more about the change and will write about it then.